Last Saturday was the second Saturday of the month, and therefore time for a Scrum club game– at the standard location. The month being chill, the time was now for a Halloween themed game. When it comes to horror games, it seems as if zombies are the go-to scenario. Frankly, I can’t think of a better one. 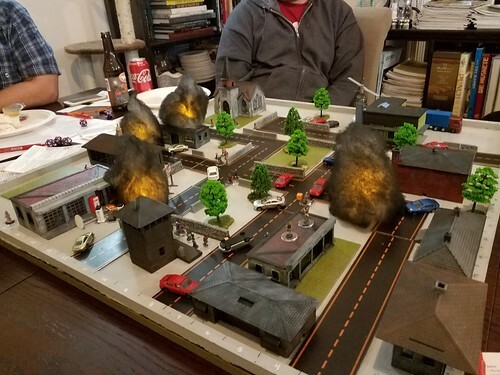 I’ve been in many a zombie game, and if you want a scenario that’s going to play out in four hours or less, you want something with simple rules and a lot of space to run. 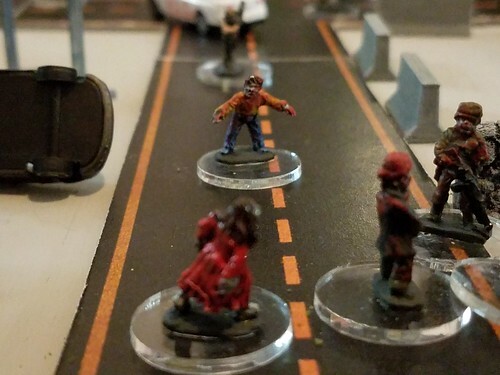 Fortunately, we had both of those– which is odd.. zombie games are something I associate with 28mm figures, myself.. it just seems to be the defacto choice. 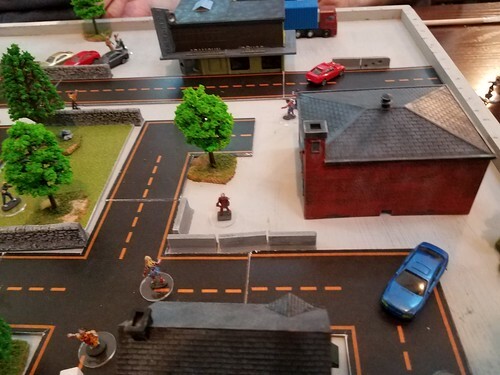 Joe, however, has made a horde of 15mm zombies, a small (HO scale) town, and some survivors. The whole thing fit on the same board that Sellswords and Spellslingers fit on, and used the same coordinate system. That was the system Joe P. was using for Conan, remember? Well, it should be familiar. 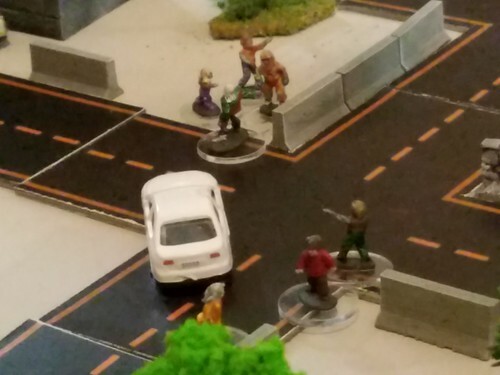 RUN FROM THE DEAD uses pretty much the same rule set, with some modifications for modern weapons and zombie horde tactics. We found it pretty simple..
Set up, Church is in background. This is where we came on the board. North East Side of town, near the hospital. 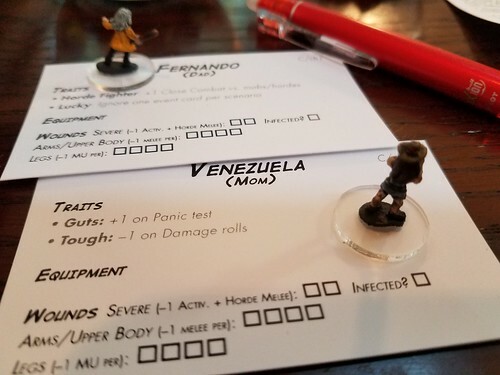 My two characters, “Fernando” and Venezuela. The goal was to get home across the board. Neither Nando nor Zuela made it. The action started at the church. The townspeople were mostly at a wedding. The Groom pulled back the bride’s veil and she went zombie on him, ripping his tongue out when he leaned in for a kiss. 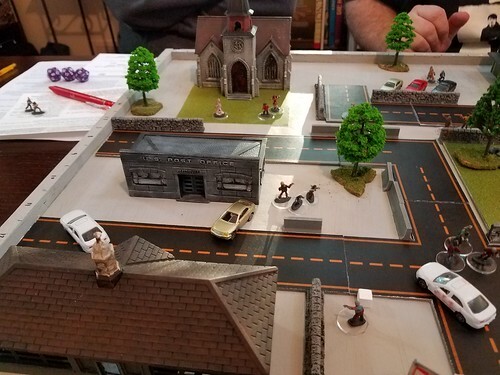 And thus it started, with the townspeople piling out of the church to find the town being overrun by the shambling dead. Like Sellswords, Run From the Dead encompasses the narrative action into a very large event/action deck, plus a monsters deck. The Events are the only way Zombies activate in the game– sound does nothing to start them up (except in a very generalized way). Like sellswords you can roll a 1, 2, or 3 activation D20 to activate and try to get over 10. If you succeed, you have one success and can commit one action. If you fail, you draw an event card (these are not ALWAYS bad– things like a helicopter gunship buzzing the town happen, and earthquakes and fire etc). The deck isn’t’ just an activation device for monsters, if you build it correctly, you can contain a heaping lot of game narrative in there. We had three major fires start (see the Flickr slide show for movie snippets.. links below). This impeded our movement and in one case wounded one of us, but it also impeded movement of zombies.. so not all bad, right? I had a pretty good time playing this. Joe’s system was a reprise of Sellswords, which I liked enough to have my confidence in Ganesha Games restored. It’s a great little system that does scale up to a modern, larger scenario than the Conan game we used it for. I would have liked to have started with a decent missile weapon. When everyone is just running from the bad guys all the time, there was precious little “cooperation” in this “Cooperative Game”.. more like “Git outta my WAY!” Joe was trying to introduce stuff gradually, I get it, but the result was probably more draconian than reality.. It was good fun, we played with two new guys, Josh and David. They seemed to get into the spirit of things in point-blimfark. I would definitely play this one again– I like a classic zombie chase game. November’s Scrum events will take place at Fall IN! Where both Joe and I are running games.